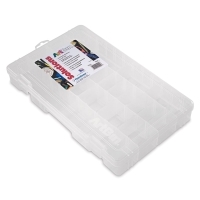 ArtBin Solutions Boxes are translucent plastic storage boxes that come in a variety of sizes and configurations for storing and organizing art and craft supplies, sewing supplies, and more. Acid-free interior and no-spill latches. Made in the USA. This box has four fixed compartments and 20 removable dividers for customizing. Measures 14-1/8" × 9" × 2". 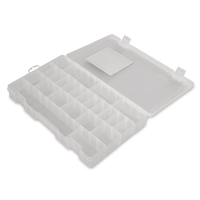 ® ArtBin is a registered trademark of the Flambeau Products Corporation.™ Solutions is a trademark.